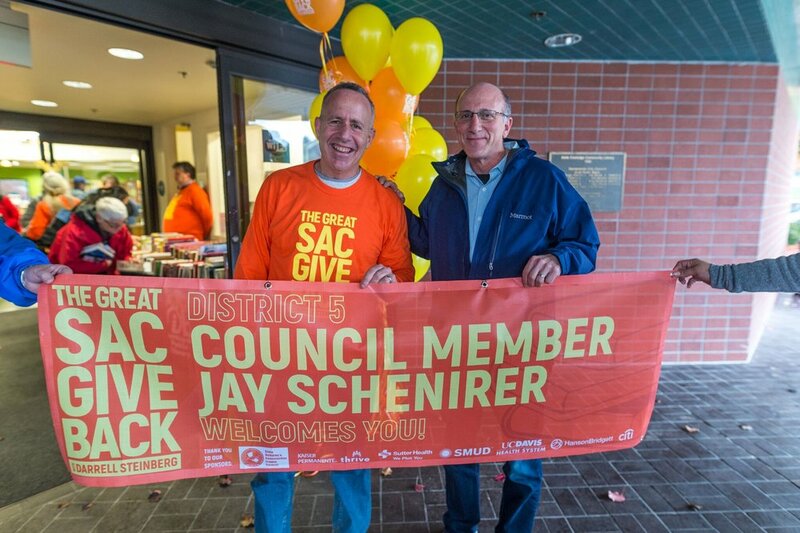 Launched in 2016 as the official kick-off to Mayor Darrell Steinberg's swearing in as mayor of Sacramento, The Great Sac Give Back was an initiative to interconnect neighbors and the organizations that are integral in their community by asking people to contribute time, a willing heart and a pair of hands. The Great Sac Give Back was a weekend of hands on service based projects designed to be a fun, educational and engaging series of events. The weekend includes family-friendly service projects, food, live music, and other festivities. In the first year, the goal was to bring eight districts together and bring out 500 people to do community service projects throughout the city. With the united help of or sponsors and partners, we were easily able to met our goal in each of the eight districts in Sacramento. In the years to come, our goal is to continue to grow the service projects and the volunteers that fuel them. Sponsors and partners of the Great Sac Giveback share a pride for the city of Sacramento, the people that call it home, and a engaging way to bring community together through collaboration and community service. Past sponsors include: State Building & Construction Trades Council, Kaiser Permanente, SMUD, Sutter Health, UC Davis, and more.